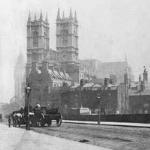 PhotoLondon is a consortium of five major London Archives: the National Monuments Record, Guildhall Library, London Metropolitan Archives, Museum of London and Westminster City Archives. These collections represent a large proportion of London's topography, people, architecture, archaeology and landscape. The PhotoLondon website acts as a gateway to the archives of each institution, but also provides background information and photo essays. The long-term aim is to create a forum of discussion and a more comprehensive survey of public photographic collections.